A physical device is an installed hard disk, Flash card, external USB disk or any device that holds data. It can be scanned in order to detect deleted (damaged) partitions or files by their signatures at the same time. Detected partition can be scanned as any other logical drive for files and folders. You can scan detected partition to verify partition content before partition restoration or to be able to recover (copy) files to safe location if partition was deleted or damaged. Define scan range and other scan attributes if necessary. Select this option to specify exact file types to be detected during the scan. 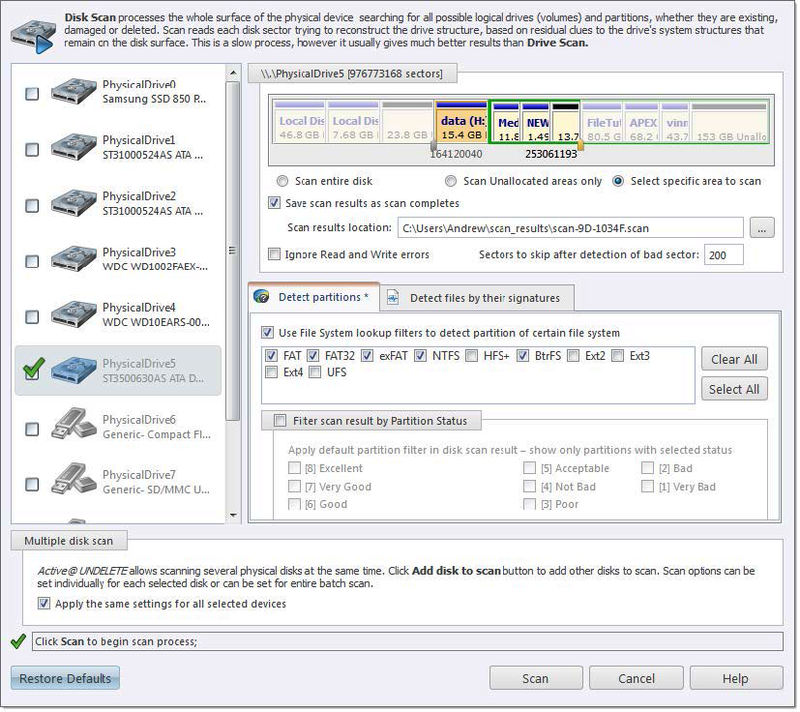 With this option, device scan reads each disk sector trying to reconstruct any possible data related to unique file format. Important: Turn this option off when you only want to detect and restore partition - it will significantly save your scanning time. Define scan results refining filter by partition integrity status. Additional disks can be selected to scan on the Physical disks list to be scanned simultaneously. At least one disk must be selected. Click Scan to initiate scan of selected disks. After the scan completes you will see scan results in the Work with device scan results. A Logical Drive scan result appears in the Device scan result view where results can be reviewed and files selected for recovery. Note: We recommend you to save scan results to designated location for later use - you can use saved scan results to save time on repeated scanning of same volume.